The remains of the home following the fire. A Bartica family lost their home yesterday, after an early morning fire quickly ravaged their two-bedroom flat. The fire, of unknown origin, started around 9:30 am at the back of the Lot 114 9th Street, Third Avenue, Bartica residence, which was shared by siblings Michelle and Neil Garraway and their two children. Neil works in the interior as a truck driver and had left early yesterday morning to return to his job, while Michelle works as a caterer. 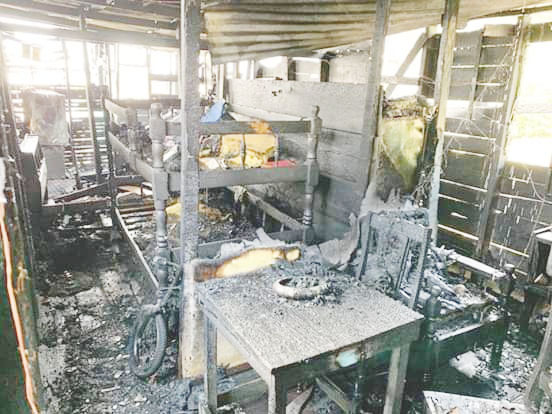 The fire destroyed their fully furnished two-bedroom wooden house and while residents attempted to extinguish the flames, the fire raged out of control. However, firefighters who responded promptly, managed to contain it before it could spread further…..